“He was physical perfection. He seemed like a mythical figure. I love Messi, I played many times with Cristiano and I adored him, Neymar is outstanding, Ronaldinho was exceptional, but if you put all of them together, you might get what Ronaldo was that season.” Doing justice to Ronaldo’s exploits during the 1996/97 season is nigh on impossible, but Quinton Fortune’s portrayal of O Fenómeno as some kind of fabled hybrid seems closer than most. Described by Spanish football historian Sid Lowe as “possibly the best individual season I have ever seen”, Ronaldo didn’t so much play games as he did glide through them. The turf became a palette, upon which he blended pace, power and skill to produce what can only be interpreted as art through the medium of football. Never was this more evident than on 26 October 1996. The allure of Ronaldo’s performance that night was accentuated further by the fact it came against the backdrop of a club in turmoil. The preceding summer had seen legendary manager Johan Cruyff depart Barcelona under a cloud of outrage and uncertainty. Worse still was that Cruyff had an agreement in place with Bordeaux for the transfer of budding French playmaker, Zinedine Zidane. Left in limbo following the coach’s sacking, Zidane opted instead for Italy, penning a five-year deal with Marcello Lippi’s Juventus. The Catalan fire had been stoked. The prevailing incumbent of Barcelona’s hotseat, Bobby Robson, knew he must act quickly to appease fans with a big-money signing. And so, after making waves in the Netherlands, following his move to Europe, Ronaldo Luís Nazário de Lima was plucked from PSV Eindhoven and thrust into the Camp Nou spotlight. It took Ronaldo just six minutes to show why Robson had stumped up a world-record fee to sign him. As recalled by Spanish football expert, Graham Hunter: “Fed by Giovanni midway between the halfway line and Atleti’s goal, the Brazilian used the space, sashayed past one challenge and slide-ruled the ball into the right-hand corner of José Molina’s net.” Barça had won the Supercopa de España, and this was just the beginning. From there, Ronaldo exploded. At times it felt more akin to watching a tennis match; audiences craning their necks left and right as Ronaldo picked up the ball, ran at goal, scored, then jogged nonchalantly back to the halfway line. The importance of Ronaldo’s performances to Barcelona were rivalled only by the attention he bestowed onto himself. Not helped by his representatives, O Fenómeno began to believe the hype and was soon at loggerheads with the club’s hierarchy, insisting they attach a far more handsome figure to his weekly pay slip. Corporate upheaval didn’t detract from his mesmeric displays, though. Far from it. As Ronaldo lined-up against Valencia, his status already eminently revered, you’d have been hard-pressed to find a more precious individual on the planet. If physiological frailties are half the battle in professional sport, then Ronaldo stood scarless in victory; he was ready for the war. Not 15 minutes in and the Brazilian took flight, accelerating through the gears quicker than any Ferrari lining the directors’ parking lot. Fearful of the impending danger, Valencia’s defence tried to close off Ronaldo’s path, ultimately in vain. He was too fast, squeezing through the body checks to finish with aplomb into the bottom left corner of Spanish number one, Andoni Zubizarreta’s net. It soon became clear there was little Los Che could do. This was the world’s best player who, were it not for his own atypical finishing at times that evening, may well have had six. O Fenómeno doubled his tally before the changing of ends with another trademark burst of pace, leaving players in his wake and slotting home into the same corner, this time on his supposedly weaker foot. In the second-half Luis Aragonés’ men rallied, clawing back the two-nil deficit before the hour mark with goals from Patxi Ferreira and Valeri Karpin to help the away side regain parity. Then, Ronaldo struck once more. This time with the goal of the evening. A 50/50 challenge just inside the Valencia half bobbled kindly into the Brazilian’s path. Running at pace, with the sort of close control seldom seen from his contemporaries, Ronaldo left Aragonés’ entourage for dead. He passed one, two, three opponents before finally slipping through an even more improbable gap, this time between the helpless limbs of Jorge Otero and Xabier Eskurza. The striker even had time to adjust his body shape before collecting himself and side-footing again past the helpless Zubizarreta. “One of the legacies from my year in charge”, Bobby Robson later remarked in his book, Farewell but not Goodbye, “was to bring Ronaldo to the great Catalan circus.” Robson’s words may seem light-hearted upon reflection, but at the time they were far more nuanced. 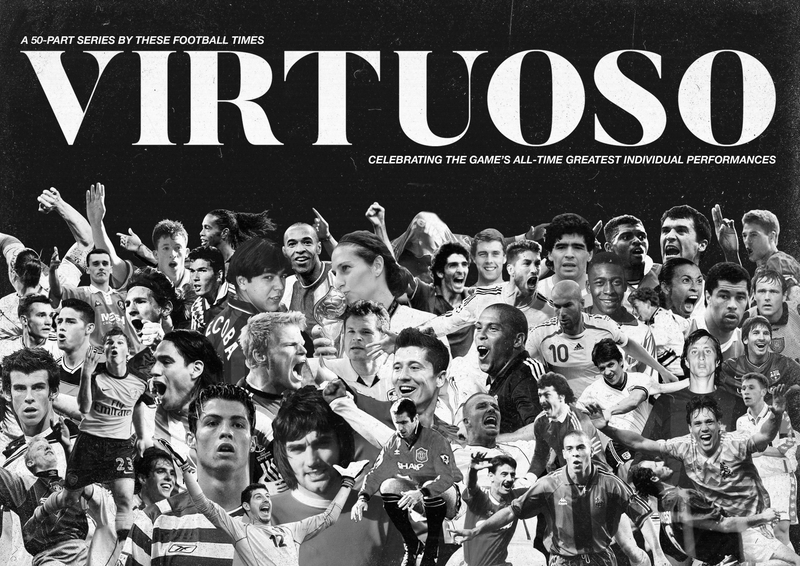 The theatrics of Spanish football can only be matched by its ability to inspire awe and in the Cirque du Barça, ringmaster Robson had delivered Culés their main attraction. A knock near the end of the game would later spark a long-standing feud between Ronaldo and the club’s physio over an incorrect diagnosis; the birth of an injury that would cruelly curtail the career of a generational talent. At the season’s close, Ronaldo had amassed 34 league goals, nine more than his nearest challenger for the Pichichi. Alas, it was not enough to topple Fabio Capello’s Real Madrid and Barça finished runners-up. By then, Ronaldo’s over-inflated ego had grown to such an extent it burst the bubble surrounding his air of invincibility. The club eventually grew tired of protracted contract negotiations and agreed to sell their troublesome virtuoso to Internazionale, breaking the world-record transfer fee again in the process. 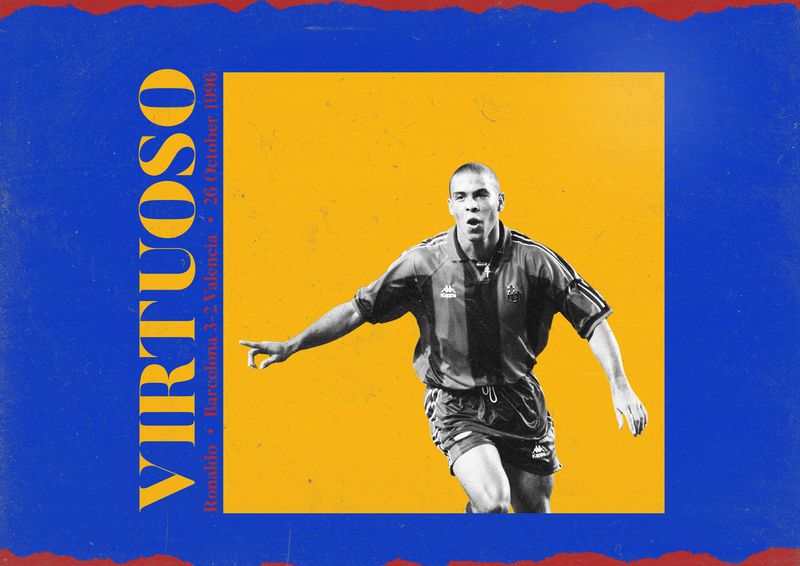 Recurring knee injuries would plague the remainder of Ronaldo’s career but for that one season – in that iconic blue and garnet strip – the world was afforded a front row seat to see vintage Ronaldo in action. On 26 October 1996 he truly was the phenomenon and, boy, didn’t he just know it.